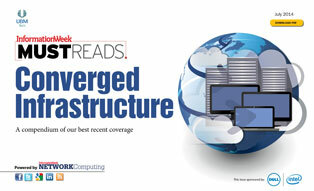 Network Computing's July Must Reads is a compendium of our best recent coverage of converged infrastructure. Find out what you must keep in mind when considering converged infrastructure, why hyperscale is invading the enterprise, how the software-defined revolution affects you, and more. Access to this digital issue is free -- just click the "Go To Digital Issue" button below. If you haven't already signed up for exclusive digital content from the InformationWeek Business Technology Network, you'll be asked to register. It's free and takes only a few minutes. Yes, I would like to receive messages from Dell about products, services, and special offers, as well as additional information on this topic from Intel®. Your data will be handled by Dell in accordance with Dell's Privacy Statement and by Intel® in accordance with Intel's® PrivacyPolicy.